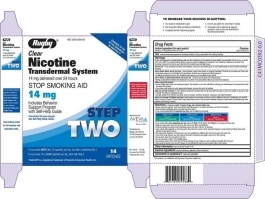 Reduces withdrawal symptoms, including nicotine craving, associated with quitting smoking. Compact disc, self-help guide, and disposal tray included. If you smoke MORE than 10 cigarettes per day: use after completing Step 1. If you smoke 10 or LESS cigarettes per day: start with Step 2. If you are under 18 years of age, ask a doctor before use. Before using this product, read the enclosed self-help guide for complete directions and other information. Stop smoking completely when you begin using the patch. If you smoke more than 10 cigarettes per day, use the following schedule below: Weeks 1 thru 4: STEP 1 use one 21 mg patch/day. Weeks 5 and 6: STEP 2 use one 14 mg patch/day. Weeks 7 and 8: STEP 3 use one 7 mg patch/day. If you smoke 10 or less cigarettes per day, start with Step 2 for 6 weeks, then Step 3 for 2 weeks and then stop. Apply one new patch every 24 hours on skin that is dry, clean and hairless. Remove backing from patch and immediately press onto skin. Hold for 10 seconds. Wash hands after applying or removing patch. Throw away the patch in the enclosed disposal tray. The used patch should be removed and a new one applied to a different skin site at the same time each day. If you have vivid dreams, you may remove the patch at bedtime and apply a new one in the morning. Do not wear more than one patch at a time. Do not cut patch in half or into smaller pieces. Do not leave patch on for more than 24 hours because it may irritate your skin and loses strength after 24 hours. Stop using the patch at the end of 8 weeks. If you still feel the need to use the patch talk to your doctor. TO INCREASE YOUR SUCCESS IN QUITTING: 1. You must be motivated to quit. 2. Use one patch daily according to directions. 3. Complete the full treatment program. 4. Do not use patch for more than 8 weeks. 5. Use patch with a behavioral support program, such as the one described in the enclosed booklet and on the compact disc. If you are pregnant or breast-feeding, only use this medicine on the advice of your health care provider. Smoking can seriously harm your child. Try to stop smoking without using any nicotine replacement medicine. This medicine is believed to be safer than smoking. However, the risks to your child from this medicine are not fully known. Do not use if you continue to smoke, chew tobacco, use snuff, use nicotine gum, or use nicotine patch or other nicotine containing products. Ask a doctor before use if you have: heart disease, recent heart attack, or irregular heartbeat. Nicotine can increase your blood pressure; an allergy to adhesive tape or have skin problems, because you are more likely to get rashes. Ask a doctor or pharmacist before use if you are: using a non-nicotine stop smoking drug; taking a prescription medicine for depression or asthma. Your prescription dose may need to be adjusted. When using this product: do not smoke even when not wearing the patch. The nicotine in your skin will still be entering your bloodstream for several hours after you take off the patch; if you have vivid dreams or other sleep disturbances remove this patch at bedtime. Stop use and ask a doctor if: skin redness caused by the patch does not go away after four days, or if your skin swells, or you get a rash; irregular heartbeat or palpitations occur; you get symptoms of nicotine overdose, such as nausea, vomiting, dizziness, weakness and rapid heartbeat. Keep out of reach of children and pets. Used patches have enough nicotine to poison children and pets. If swallowed, get medical help or contact a Poison Control Center right away. Discard used patches using the enclosed disposal tray. For your family's protection, patches are supplied in child-resistant pouches. Do not use if individual pouch is open or torn. Not for sale to persons under 18 years of age. Proof of age required. Not for sale in vending machines or from any source where proof of age cannot be verified.